In celebration of the upcoming Chinese Lunar New Year, the Bureau of Engraving and Printing (BEP) is pleased to announce the newest addition to its Lucky Money Collection: Year of the Pig 2019! The “Pig” is one of 12 zodiac signs associated with the Chinese Lunar Calendar. Year of the Pig 2019 is exquisitely designed with decorative Chinese symbolism and is packaged in a symbolic, red folder with embossed, gold foil. 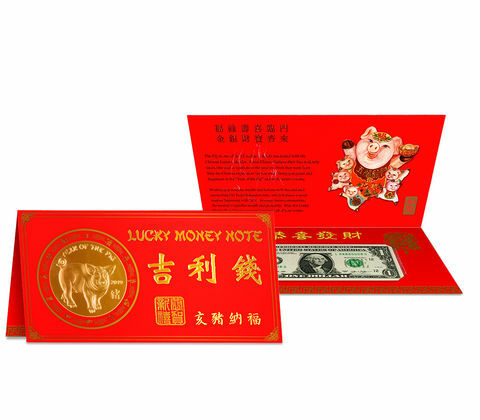 This product features an uncirculated, $1 Federal Reserve note with a serial number beginning with “8888.” The Year of the Pig 2019 symbolizes the character traits of loyalty and honesty. This product is $5.95 and only 108,888 will be available for sale. The Year of the Pig 2019 first day of sale is Tuesday, December 18, 2018 at 12:00 p.m. (ET). Household quantity purchase limit restrictions of 250 units for the Year of the Pig 2019 will be imposed for the first two days of release. On December 20, 2018 household purchase restrictions will be waived. BEP products may be ordered toll free, at 1(800) USA-MINT (872-6468) and through the United States Mint’s online store, https://catalog.usmint.gov/. For information about bulk pricing for quantities of 1,000 or more Year of the Pig 2019, contact the BEP at 1(800) 456-3408.